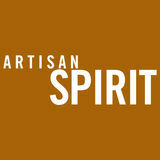 A SPIRIT THIS WELL-CRAFTED DESERVES AN ARTISANAL GLASS. CALL 877.927.6089 OR VISIT TAP.BEERCUP.COM/ARTISAN TO LEARN MORE. within the space, but he plans to limit the available gin SKUs to four or five. Expect some seasonal releases, as well as some one-offs. “What I don’t want to do is have so many things on the shelf where people can’t discern, ‘Okay, what is their gin that they’re actually known for,’” he says. And though Royal Foundry is making a Navy Rum, it’s not necessarily navy strength. It’s more about the Navy-inspired flavor. McLain’s team finishes some in bourbon barrels and some in port barrels and then blends those together, resulting in the right level of spice and aroma. Royal Foundry is operating two main stills, one whose capacity is listed as 240 gallons, but has a true working capacity of 300 gallons. The stillhouse also features a smaller, 60-gallon pot still with a four-plate column on top. There’s also a 600-gallonplus mash tun. But beyond the production facility, Royal Foundry also boasts what’s been called the largest cocktail space in the Twin Cities, taking up a substantial chunk of the distillery’s 15,000 square feet. The high-ceiling, industrial-chic space is open seven days a week and features a sprawling bar that seats more than 20, as well as more than a dozen communal tables. “The cocktail room is what is going to afford us the time, ultimately, so we’re not rushing out the product to the shelves,” McLain says. “The idea is through that [cocktail room] portal, we can do some really cool cocktail stuff and then roll out our distribution products when it makes sense. And that especially makes sense from the single malt side.” For the single malt, Royal Foundry is adhering to Scottish 9:16 AMlaw by not bottling any of it before it’s spent at least three years in the barrels. “If things are going well with the rest of our business, well probably push some to four,” McLain says. “There will be some excitement if we did [a] push out at three [years], but I really want to make sure it’s tasting good at that point in time.” He says he’s leaning toward a sherry finish on much of the whiskey. This summer, the distillery plans to open a 70-meter bicycle track outside the building to host cycling competitions in the spirit of the English sport Cycle Speedway. “We’re a big cycle community and I wanted to bring a cycle sport that has British ties, not just some random sport,” McLain explains. “And we wanted to have some entertainment value outside the space. 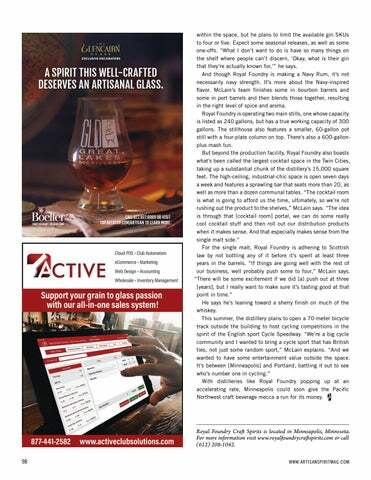 It’s between [Minneapolis] and Portland, battling it out to see who’s number one in cycling.” With distilleries like Royal Foundry popping up at an accelerating rate, Minneapolis could soon give the Pacific Northwest craft beverage mecca a run for its money.